NewbieDM Review: A Whole Bunch of Stuff…. 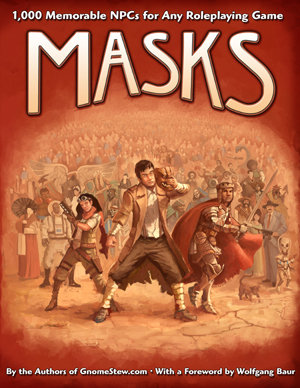 As if the ENnie winning Gnome Stew guys didn’t receive enough praise after “Eureka: 501 Adventure Plots to Inspire Game Masters” Martin Ralya and the rest of his gnomes have released their latest book, Masks, and it is pretty fantastic. At 337 pages, Masks is a system neutral book of NPC’s, divided by genre: Fantasy, Sci-Fi, and Modern. Each genre is further divided by Villains, Neutrals, and Allies, offering a wealth of NPC’s for your game. What I really like about the book, and its strongest feature for me is its “get to the point” attitude. Each NPC is presented in a condensed template that gives you just enough information to spark your imagination. In a template you’ll find an NPC’s name, a noun-adjective description (ie: Chipper Innkeeper), a quote, appearance, roleplaying notes, personality, motivation, background and traits. It is simple, and effective. They book fits four templates per page, while some NPC’s occupy a full page to make room for artwork. At first glance, it seems simple, but as you read some of these NPC’s, you’ll find that there are hidden gems there to spark your imagination and create stories around these personalities. That alone makes the book worth its price, but there’s more. It seems like the authors wanted to use as much page space as possible, because the footnote for every page in the NPC chapters of the book consists of a “name ribbon”. Need a quick Sci-Fi name for a guy at a cantina? Flip to any page in the the Sci-fi chapter and pick a name from the name ribbon below. Another useful part of the book are the indexes. You can find the NPC’s by trait, name, author, or even by NPC Groups, which combine various of the characters into groups like City Watch Unit or Cyberpunk Rivals. All in all, I can’t recommend this book enough. Masks is a fantastic book. Midgard Bestiary Volume 1, written by Josh Jarman is the first third-party book for Green Ronin’s AGE system (the system that powers the Dragon Age RPG). This is important because we are finally seeing glimpses of the AGE system stripped of its Dragon Age shackles, and that’s a good thing. But enough about that, lets get to my thoughts. The book is written primarily for Open Design’s Midgard setting, but thanks to the magic of re-skinning, we are finally seeing a generic AGE monster manual. There are 50 monsters here, arranged alphabetically, each taking up a full page with accompanying artwork. I am not familiar with the Midgard Setting, so as a Dragon Age GM, I’d look at an entry like the Alseid Hunter which is basically a Elf/Deer centaur, and have to get creative since it doesn’t fit the world of Dragon Age. Creative how? Well, I’d probably take the stat block and re-skin it to something else. Other things, like Carrion Beetles seem like they’d fit well in just about any fantasy setting, so I’d use as written. The nice thing is that through the monster text a bit of Midgard lore shines through, so for folks like me it’s a step into a new world, and I can tell you that I’m intrigued by it. The monster entries include a small paragraph of flavor text to set the mood, and a description of it that includes combat tactics. The stat blocks are well written, and match the look set by the Dragon Age books, with monsters using stunts from both Set 1 and Set 2. One thing that stood out was the artwork, some of it is in color and some in black and white. I’m not qualified to say if it’s because some of it came from previous Midgard books though, which may be the case. If you are a Dragon Age GM, this book is a welcome one, as it expands the available monsters you can throw at your party. Unfortunately, some of the monsters don’t fit well within the Dragon Age canon, and ultimately it’s up to you as a GM to decide whether that matters or not. A book like this bestiary makes me happy though, because we are finally seeing glimpses of the AGE engine as a stand alone system, and that’s something that I’m looking forward to. Should you buy the book then? Again, it’s a well written book. Writing is top notch, and the art is nice. if you are playing in Thedas and are a sucker for canon, you may need to get creative with the monsters though, they don’t fit the world. If you just want monsters and don’t really care about that stuff, then the answer is a resounding YES! Also, the title having a Volume 1 in it implies that there will be a Volume 2. So double-rainbow YES! 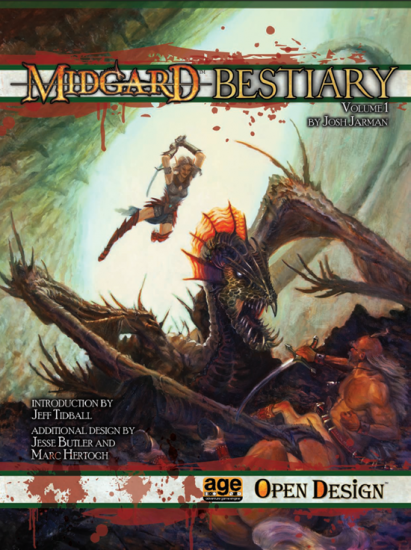 You can find the Midgard Bestiary Vol. 1 for AGE here. Calling itself “The Switzerland of the Edition Wars”, Open Design’s Kobold Quarterly has really become a major player in the RPG world. As mostly a 4e DM up until recently, I really didn’t give Kobold Quarterly the shot it deserves, but I believe that this has to do with the system’s inability to really allow 3rd party stuff to fully integrate with it. Pathfinder is not really my thing, and a large bulk of the content of KQ is devoted to Pathfinder, so I kind of ignored it. I was wrong, and I admit it. The magazine has become an outlet for many, many familiar names in the blogging community to get their foot in the door. ENnie nominated bloggers like ChattyDM, Sarah Darkmagic, and Quinn Murphy from At-Will have had articles published in its pages, and this is nothing but a positive. But lets look at this particular issue, because as a AGE GM, it excites me. The first article is called “Gifts of the Gods” by game designer Steve Kenson (Mutants & Masterminds, Icons). This article introduces the divine to the AGE system, again showing glimpses of the engine stripped from it’s Dragon Age clothing. For Pathfinder there’s an article highlighting a class, The Savant, and a 1st level adventure, along with a Prestige class called Dragon Hunter. For 4e there are a few offerings as well, there is a Siege Weapons article written by Matt James, which feels like an extension of his Open Design book “Soldiers of Fortune”, and there’s also an article on building mysteries using skill challenges along with a few other articles to round out the 4e content. One article I found interesting was a solo adventure, Silus and the Red Dogs. 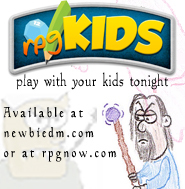 it is played with a d20, and it’s essentially a choose your own adventure type story. What’s interesting to me is that it’s labeled as multi-system (4e, Pathfinder, and AGE). The rules call for a simple d20 roll, which Pathfinder and 4e use, but not AGE. Not sure why even label it as such, but minor quibble nonetheless. For me this particular issue of Kobold Quarterly, along with the few other back issues that have introduced AGE material, are very useful. I’m not particularly looking for third party 4e material, or Pathfinder stuff, but it’s also unfair to judge a magazine on what I may or may not use from it. There’s a lot of stuff here for your game, no matter which game it is, 4e or Pathfinder. It’s well written, artwork is nice, and that’s what I can and should judge it on. It is a solid, solid rpg magazine, so go enjoy. Oh, and at last, us AGE gamers are finally getting some support, and that’s a good thing. 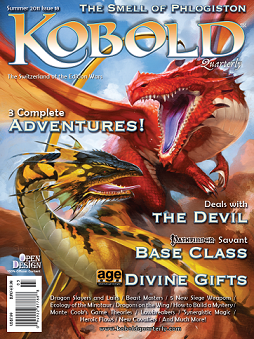 You can find Kobold Quarterly Summer 2011 Issue 18 here. EDIT: Something I should add, considering I was reviewing pdf’s, is how good they look on an Ipad. Pretty fantastic really. All three of them. Thanks for taking the time to review the Midgard Bestiary! One of the things I kept in the back of my mind as work progressed on the book, was how this could serve as a de facto introduction to the world of Midgard for Dragon Age players. I’m happy to see we were somewhat successful. Saisei (on the Green Ronin forums) also mentioned how the book sort of makes you want to know more about the world all these mad creatures call home, which combined with your impressions seem to say we got that right. As for these creatures fitting into the world of Thedas, that was certainly something I kept in the back of my mind as well during design, even if it wasn’t goal number 1 (which was to create Midgard-compatible monsters and foes). When reading through most of the monster descriptions in set 1 and 2, I kept coming back to how The Blight is responsible for pretty much everything nasty in the world. It’s responsible for twisted natural creatures (Blight wolves, Bereskarn, etc.) undead, darkspawn and even things like werewolves and possessed, sentient trees (Wild Sylvans). So, I never actually addressed this in the book, but it seems to me that so much of the Bestiary critters can be explained as “The Blight did it,” as anything else. Maybe not the clockwork creatures and Midgard races, but certainly a lot of other things. As someone else suggested maybe ideas on how to make these monsters work in Thedas should have been included, and that’s a good critique. Hey, if we do get to do a volume 2, I’ll make sure it gets in there! Thanks again for the review and your help with playtesting. I can’t wait to hear reports of these monsters in play at your table. Cheers! Thanks for reviewing Masks! I’m especially glad you like the “hidden gems” aspect of the book — it’s definitely intended to be more than just fire-and-forget NPCs. Good stuff! I like the look of Masks. I always enjoyed the “Rogues Gallery” features in Polyhedron, back in the day. That type of thing is not only handy in a pinch but can be a fun read during down-time. Didn’t Spoony mention something similar to Masks in one of his Vlogs? He gave it a thumbs up too, IIRC, but found the non-fantasy settings a bit superflous. Was called “Legends” or something?